Egyptians are defying a curfew and are still in the streets of Cairo tonight. Anderson gives you an up close look at the uprising tonight on 360°. 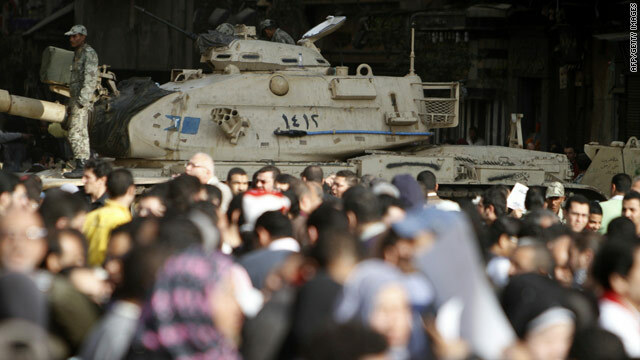 Egyptian demonstrators gather in Cairo's Tahrir Square close to a military tank on Monday. Anderson is reporting live from Cairo, Egypt tonight. He'll have the latest developments from Egypt's capital city. Protesters remain in Tahrir Square where they're demanding that President Hosni Mubarak resign, but at this point he's ignoring those calls. Tomorrow could be a critical day in Egypt. Demonstrators are organizing what they're calling a "march of millions." In preparation of that march, Egyptian security forces have placed concrete barriers in strategic locations. We've also learned that Noor Group, an Internet service provider, has been shut down. This takes the country offline. The government is also planning to shut down mobile phone networks before the march. 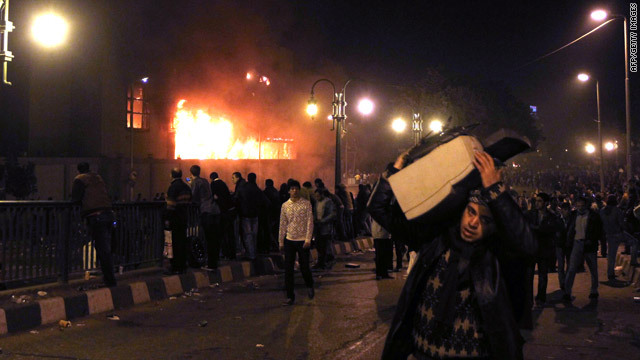 The Egyptian army said there will be "no violence" against the people. "We reassure the armed forces are a force of stability and security for this great nation. The protection of the people is one of its core values," said a military spokesman on state TV. About 2,600 Americans are still trying to get out of Egypt tonight. Some 1,200 got on chartered flights today. Anderson will talk with two Americans trying to get out. They say they're not getting much help from the U.S. embassy. Anderson also got an exclusive interview with Mohamed ElBaradei, the former head of the International Atomic Energy Agency who returned to his native Egypt last week as an opposition leader. ElBaradei told Anderson that the United States needs to "let go" of its longtime ally. "My message to President Obama, and, I have lots of respect for him, I worked with him, you know, in the last year of my tenure was at IAA and I have a lot of admiration for him, but I tell him, you need to review your policy, you need to let go of Mubarak, you shouldn't be behind the curve and you need to start building confidence with the people and not with the people who are smothering the people." Join us for these angles and much more live from Egypt starting at 10 p.m. ET on CNN. See you then. First ever campaign news conference broadcast on 7-second delay. "Actually its a Green Tea moisturizer and I use a herbal essences shampoo with color guard....next question?" Reporter's Note: The government will release new unemployment numbers later this week, and lately that has been cause for people in DC to hold their breath; kind of like the president must do every day when he sees my letter! Ha! I am writing to you today from the great state of Nevada. We are here on our latest Building Up America trip, and I must say it has already been an eye-opener. Over the past couple of months as I have looked at unemployment reports, and foreclosure rates, and all those other indicators, I’ve noted many times that the Silver State is pretty much the gold standard for terrible times right now. Unemployment here has been pushing up toward 15 percent. The gambling business is down; tourism is in the tank; construction is staggering. But to be here on the ground and see the results firsthand is truly disturbing. Now, don’t get me wrong: This is still a great vacation destination for people who are looking for all the bright lights and excitement that Las Vegas has always meant. The Strip is still glittering and gaudy, and you can still find big shows and big crowds flocking to see them any night of the week. But the crowds just aren’t as big as they were. And they seem to be sitting on their wallets more. So the less money the tourists spend, the less the locals have. The less the locals spend, the less jobs business owners can support. And on and on it goes. As you make your way around town you can see the results. Sure there are plenty of businesses that look busy and fine, but I went on a long run and I was struck by how many other places were closed up and dark. Many of them leave all their signs in place so it looks like they are still in operation, but when you get closer you see that they are empty shells…like a Hollywood set depicting a thriving town. People here are trying to do something about it. We’ve talked to business, political, and education leaders who really are doing all they can to attract other companies; high tech, green energy, film and video production; anything they can lay their hands on that might create work. But we’ve also talked to working folks who, at least at the moment, are pretty skeptical that any of those clever plans will produce any real results any time soon. I know that you’ll be plenty busy watching the events in Egypt this week, and I can’t blame you if you are preoccupied a bit. But being here has already been a stark reminder of just how much trouble many of our fellow Americans are in, and how that has to remain priority number one as long as it takes until things are better. Because you can see it easily here: When the economy stops working, everything and everyone suffers, no matter how much they try to put on a brave face. We’ll be doing reports from Nevada all week, introducing many of the wonderful and clever folks here. I hope you get a chance to see some of the reports. And, as always, call if you can. Reporter's Note: The president is paying a lot of attention to the events in Egypt. So am I in today’s letter to the White House. I keep thinking about Egypt this weekend, and I can’t help but be reminded of what I’ve always considered the central puzzle of diplomacy. We make deals with whomever is in charge in a given country; we build relationships; and as time passes…things change. Then one day we look across the waves to see fires burning and tanks rolling and we have to wonder: On which side of this conflict do we want to stand? That’s was really the question in Egypt from the moment the trouble started. Should we stand with the ruling government so that, when and if the troubled subsided, they would feel reassured that we were always in their corner? Or should we lend support to the usurpers, so they would feel as if we had befriended them and encouraged their movement when the future was in doubt? It’s a tough call, and I don’t envy you the task. Oh sure, it is easy for us normal citizens to say, “Just do the right thing,” or “We should support our long time ally,” or “Let’s help the protesters bring about change.” But those statements, amid the turmoil we are seeing, seem overly simplistic. Think about Iran not so long ago. There too, protesters filled the streets, violence followed and it appeared that the government might be toppled. Iran’s bosses ultimately held on, but even if they had been driven out, a central question remained unanswered. We knew what the protesters were against; but what precisely were they for? That is something we’re not sure of in Egypt either. Heck, we’re not even certain who they are, or who is the prime organizing force, or even if there is one. You no doubt will hear a lot of pressure to speak up more forcefully; to more clearly state a position. There may even come a time when you feel as if that is the right course. But be ever mindful that this is tricky territory. We most assuredly should do the right thing; but figuring out what is right…holds a million ways in which we can go wrong. The events in Egypt certainly seem momentous. I am always amazed at how populations can sometimes bubble for years with discontent, and then suddenly boil over in a fit of smashed glass, overturned vehicles, and fires in the streets. But I think I have mentioned to you before a quote that I read in a history book long ago; it went something like, “The fundamental cause of all revolutions is the inability or unwillingness of the rulers to take seriously the complaints of the ruled.” I wish I could remember who wrote that. Anyway, I am struck by how often that seems to be true when people and police start running at each other. Usually I think, if you consider all events, people are remarkably patient. They will endure years of low employment, weakened living conditions, and limited hope precisely because most citizens in most places realize that uprisings can be messy things; property gets destroyed, people get hurt, pets get lost, and it’s hard to figure out where things will stand when the smoke clears. Still, when people are frustrated long enough, and feel too marginalized, they start imagining (or perhaps realizing) that they have no other choice. It’s been suggested that it is impossible to predict when some place is going to flash into rioting and calls for a coup. But I’m not so convinced of that. Sure, it is hard to pinpoint a date, but often in retrospect it is easy to see how tensions rose, were ignored; rose higher, were pushed aside; rose still more…and finally exploded. The secret is in seeing things not only through the eyes of the rulers, but also through the eyes of the ruled. The second is harder, because the ruled don’t sit in high level diplomatic meetings, or brief visiting dignitaries. But understanding the views of the citizens and taking them seriously is how uprisings are avoided; and ignoring them, is how revolutions are sparked. Good luck with all your dealings with this over the weekend. Call if you can. We'll have live reports from Egypt where demonstrators took to the streets again on Friday and the government could be on the brink of collapsing. Though,President Hosni Mubark says he won't step down. Instead he's calling on the rest of his government to step down. 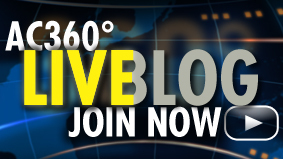 Tonight on 360°, we'll have the latest developments in the crisis in Egypt. At lot is at stake. Egypt shares a border with Israel, it's America's ally and it's the capital of the Arab world. There are a lot of questions unanswered at this hour. Will demonstrators take to the streets again on Saturday? Will the country's government resign? Egyptian President Hosni Mubarak, 82, addressed his nation on television just hours ago and made it clear he has no intention of stepping down - yet his resignation is what most protesters are demanding. Instead, he's calling on the rest of his government to step down. 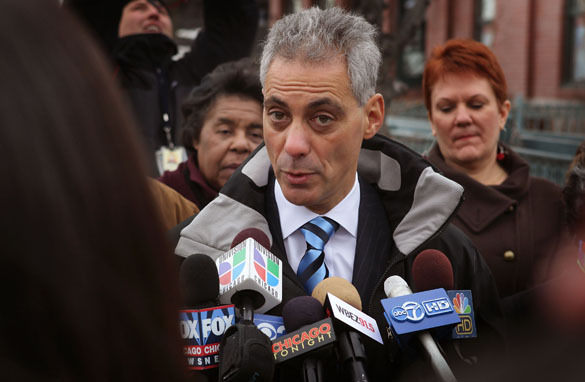 "I am absolutely on the side of the freedom of each citizen. At the same time, I am on the side of the security of Egypt and I would not let anything dangerous happen to threaten the peace and the law and the future of the country," Mubarak said. President Obama called Mubarak shortly after his speech to the people of Egypt. "When President Mubarak addressed the Egyptian people tonight he pledged a better democracy and greater economic opportunity. I just spoke to him after his speech and I told him he has a responsibility to give meaning to those words, to take concrete steps and actions that deliver on that promise," Pres. Obama said at the White House this evening. The outrage in Egypt has been building for days. Demonstrators first took to the streets on Tuesday. Then today thousands took part in the unrest. Riot and plainclothes police were joined by the Egyptian soldiers, marking the first time the army was deployed to battle unrest since 1985. The crowds chanted "Down, Down, Mubarak" in the capital, Cairo. Water cannons, tear gas and rubber bullets were used to try to stop the protests. Protesters also filled the streets of smaller cities. Our reporters and camera crews on the scene captured amazing video of the uprising. We'll share it with you tonight, along with several reports. We'll also look at what this all means for U.S.-Egyptian relations. Keep in mind, the U.S. gives about $1.3 billion in military aid to Egypt, second only to Israel. Egypt has also received about $30 billion in economic aid from Washington since 1975. Those figures are from the U.S. State Department. Join us for our special coverage from Egypt starting at 10 p.m. ET on CNN. See you then.